Jenner was born the son of a clergyman on May 17, 1749, in Berkeley, England. As a youth he developed a love of nature and an inquiring attitude. From the ages of 12 to 21, he was apprenticed to a surgeon, and he subsequently studied anatomy and surgery in London with the prominent physician John Hunter. Under Hunter’s tutelage, Jenner developed a firm belief in the importance of experimental investigation. In 1773, Jenner returned to Berkeley and began a medical practice that he would maintain for the rest of his life. Smallpox was a major cause of death in the eighteenth century. 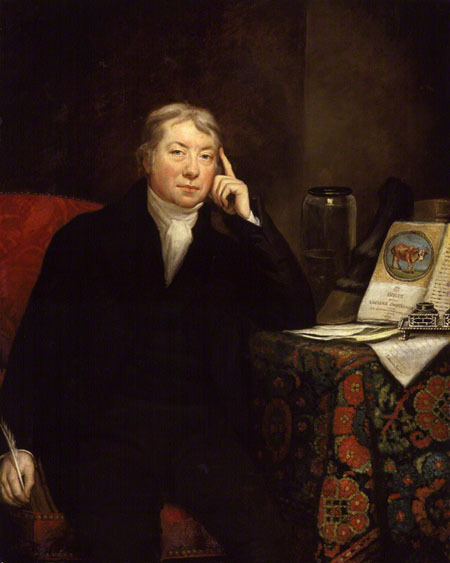 When smallpox did not kill its victim, scars or blindness often followed the diseases extremely painful duration. In Jenner’s time, physicians attempted to inoculate patients against smallpox by injecting them with pustule fluids from mildly infected people. This practice had been introduced into England by Lady Mary Wortley Montagu (1689­1762), 30 years before Jenner was born. She had observed the practice in 1717 while living in Turkey with her ambassador husband. Although the inoculation was generally successful, it was sometimes fatal, causing full blown smallpox itself. Jenner’s unique innovation was based on reports by rural patients that previous infection with cowpox, a milder disease transferred by cattle, made them immune to smallpox. In 1796 Jenner injected matter from a cowpox victims sores into eight ­year­ old James Phipps and six weeks later inoculated him again, but with smallpox, not cowpox, matter. Young Phipps remained healthy. Jenner repeated this experiment successfully several rimes, and then wrote in 1798 An Inquiry into the Causes and Effects of the Variolae Vaccinae, a description of his experimental results. The tracts publication met with resistance from physicians who did not accept his findings, and Jenner had initial difficulties obtaining and preserving cowpox inoculate. However, the procedure was soon accepted, and it spread quickly throughout Europe and North America. The rate of smallpox deaths plummeted. Jenner received worldwide fame, honorary degrees from Oxford and Harvard, and money from the British Parliament. He died in his hometown on January 26, 1823. Jenner’s smallpox vaccine relieved the suffering and saved the lives of millions of people and led eventually to the complete eradication of the disease in the twentieth century. Jenner’s inoculation method represented the second step toward ending the spread of smallpox. Once his discovery was accepted as safe, governments in Europe and North America began requiring smallpox inoculations of their citizens. The practice slowly spread to other places, and the worldwide smallpox incidence dropped. In the nineteenth century; LOUIS PASTEUR drew upon Jenner’s discovery and created vaccines against other infectious diseases, such as cholera and rabies. The study of infectious diseases and the development of vaccines progressed rapidly, and in the twentieth century, scientists investigated the physiology behind the body’s immune response. In 1977 the last known case of smallpox occurred in Somalia; in 1980, the World Health Organization announced that the disease had been completely eradicated.